Home/News/Waverley duo medal at Pacific Rim Championships! 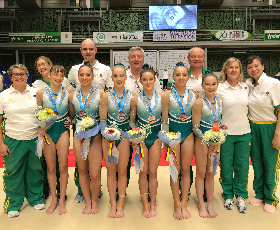 Waverley duo Talia Folino and Kate McDonald have combined with their Australian teammates to win Bronze in the Team Competition at the 2018 Pacific Rim Championships in Medellin, Colombia! 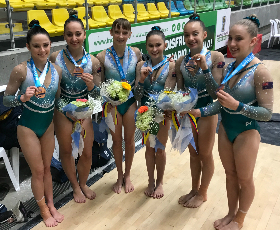 The Team Competition took place on Saturday 28th April, with the strong USA team victorious and Canada taking out Silver. Talia also finished 8th All Around, qualified for the Beam final, and was a reserve for the Uneven Bars and Floor finals. Kate unfortunately hurt her ankle on day one of training but was still able to compete on Bars where she qualified through to the final with the third highest score of the day! Apparatus finals were held on Sunday 29th April. In an eventful day of competition Talia ended up competing on Beam, Uneven Bars and Floor, due to injury withdrawals during warm-up. 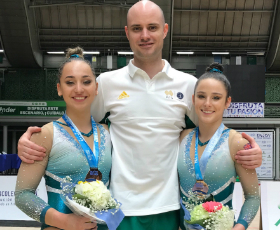 Both girls did a sensational job with Kate winning Bronze on Bars, Talia taking out the Gold medal on Beam, as well as finishing 6th on Bars and 10th on Floor. Well done Talia, Kate and coach Jeb Silsbury on a fantastic competition!